As physician leaders, you know that talking about end of life decisions is not always comfortable and many times it’s a topic both patients and physicians simply avoid altogether. In response to the Medical Officer Collaborative’s Call to Action, WSHA and WSMA have taken significant steps towards a statewide community plan to promote advance care planning through Honoring Choices Pacific Northwest. Implementation Plan: With the guidance of the Honoring Choices Work Group, WSHA and WSMA are working with Dr. Bud Hammes from Gunderson Health and Respecting Choices to develop an ambitious five-year, six-phased strategy to bring an adaptable resource to communities across the state. The First Steps® Design & Implementation strategy offers both advance care planning (ACP) curriculum and a customizable process for healthcare delivery systems, religious affiliations, consumer advocacy groups, and other community partners to promote ACP through conversation and stewardship of information. A critical aspect of the plan is to certify Faculty, Instructors and Facilitators in our state, which will ensure the sustainability of the program into the future. Website: The Honoring Choices Pacific Northwest website is currently being developed, with a proposed go-live in late September. The website will provide resource-rich information on advance care planning for both the public and for healthcare professionals, including a periodic e-newsletter, social media outlets and an Invite Family & Friends section for sharing the importance of having the conversation. As a result of the Medical Officer Collaborative’s Call to Action, the Washington State Choosing Wisely Task Force was formed to develop a pragmatic system to implement Choosing Wisely across the state, with a focus on changing behaviors, driving results and creating measurable improvement. The task force is comprised of 20 physician leaders from clinics and hospitals across the state who are leading efforts within their organization to implement the Choosing Wisely recommendations. The Washington State Medical Association, the Washington Health Alliance and the Washington State Hospital Association jointly support the statewide task force. The task force recently published the document, Choosing Wisely Claims-Based Technical Specifications (pdf 768kb), which includes a set of measures that can be used to evaluate provider integration of Choosing Wisely recommendations. Several organizations across the state have already used these specifications to run reports on their own clinical data and are identifying and addressing opportunities for improvement. Based on the Washington Health Alliance’s analysis of 2012 claims data, 25% of patients with an uncomplicated headache received either an MRI or CT. The goal isn’t 0%; however, the general sense of the task force is that 25% is too high. Because this particular recommendation impacts a broad range of specialties and providers, has a high “N”, and exposes patients to unnecessary radiation (in the case of CTs); this Choosing Wisely recommendation provides us with an opportunity to make a meaningful impact for patients in Washington state. The task force is currently developing a toolkit that physicians can use to integrate Choosing Wisely into their organization’s practice. 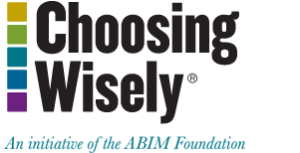 If you’d like more information about how to integrate Choosing Wisely into your organization, please email Jessica Martinson, WSMA’s director of clinical education and professional development, at Jessica@wsma.org. Why is it so hard to make lasting changes in our organizations, in our communities, and in our own lives? I recommend this book for those trying to make organizational change. We have been told that physicians will change if they are just shown good data. It turns out that is not necessarily true. The authors of Switch, using the analogy of a rider guiding an elephant down a pathway, explore three requirements for people to make a change: they must intellectually understand the change (Direct the Rider), they must accept and embrace the emotional aspects of the need for change (Motivate the Elephant) and they must know in specific terms how to get from present state to future changed state (Shape the Path). The authors provide valuable tools to overcome challenges with large-scale change by factoring in the human decision-making experience. This book is not only engaging, it is applicable to many of the challenges we face in the ever-changing health care environment. Join WSHA 100K Children Campaign! Be a national leader and join the innovative work being accomplished by the Washington State Hospital Association 100K Children Campaign! This is a statewide effort to make diagnostic imaging safer for our children through dose optimization and imaging appropriateness. The Campaign kick-off was celebrated at the WSHA Safe Imaging Safe Table Collaborative on July 8, 2014. WSHA is partnering in this work with the national 100K Children Campaign. National experts and LEAPT (Leading Edge Advanced Practice Topics) hospitals shared compelling data on the importance of understanding dose data and ensuring providers have the information needed to make the best choice for their patients. Hospitals will be collecting data related to observation versus CT for pediatric minor head trauma, ensuring dual phase studies are performed only when indicated, making a public commitment to the use of pediatric protocols, and having a process to collect dose information for pediatric head CT. Learn more about this initiative at the 100K Children Campaign Safe Table Webcast on August 21st from 1-2 p.m. To join or for questions, please contact Becky DeMers at beckyd@wsha.org or 206-216-2509. WSHA and WSMA members are reforming structures and processes to improve health care quality and reduce costs. We have seen incredible changes in the past few years; including a focus on population health and how we can work together at the community level to support better health and health care. The State Health Care Innovation Plan for a healthier Washington is guided by three core strategies and seven building blocks. Click here for details on the plan. To incorporate some of our work into the plan, the Washington State Hospital Association and the Washington State Medical Association teamed up with the Washington State Association of Leaders of Public Health Organizations. Building on our success with sharing best practices in a safe table format, we suggested we could use the same structure to exchange and share ideas on community health. Where are partnerships working well? What roles do the providers play, and what roles does the public health agency play? What barriers are there to collaboration, and how can they be addressed? All three organizations believe our members have a lot of experiences to share and learnings best come from one another. It is too soon to know if the state will take us up on our offer of support. It is not an idea, though, that we will let die even if the state is not interested. Expect to hear more from us in the coming months about how we can provide information, tools, and a forum to exchange ideas. The need for strong physician leadership is more important than ever. To help build these essential skills, the WSMA offers the following valuable opportunities. The 10-week course is a combination of face-to-face and online learning. Members receive a tuition discount. This course is offered twice per year. For full course syllabus and application information, contact Lynda Sue Welch at (206) 956-3622 or lyndasue@wsma.org. This activity has been approved for AMA PRA Category 1 Credit™. Leadership skills are essential for physicians regardless of practice setting—and were not necessarily taught in medical. This conference is one of our most popular meetings. Sessions are highly interactive and enable physicians to walk away with concrete ideas and sills that can be put to immediate use. The 2015 WSMA Annual Leadership Development Conference will be held May 15-16 at Campbell’s Resort at Lake Chelan. Teamwork is necessary to produce better outcomes. Having the whole team on the same page for the right reasons is crucial to drive real change. The WSMA is currently developing our Physician/Administrator Team Leadership Course, which will employ a custom-designed curriculum to develop the skills necessary to ensure a team’s success. The program will focus on four critical areas: communication, planning, patient safety and cost effectiveness. More details about the course will be made available later this summer. The WSMA, in conjunction with the American College of Physician Executives, now offers members access to ACPE’s catalog of 10 specifically chosen online leadership courses. WSMA members get the ACPE member rate, plus an additional 20% off. These activities have been approved for AMA PRA Category 1 Credit™. As you know the changing landscape of healthcare in the United States provides Physician Health Programs with a number of challenges and opportunities. Changes in our healthcare system including implementation of the Affordable Care Act and the aging of both the physician and general populations, the need for physicians and their services has increased at a time when many physicians are leaving practice due to age, physical and mental health issues, dissatisfaction and/or burnout. Changes in the structure of practice as well as changes in practice patterns including the rise of multi-disciplinary teams as well as increasing reliance on physician extenders has led to ongoing increases in stress. Physician Health Programs are uniquely positioned to assist hospitals, practices, and clinics in supporting the functioning of physicians. To respond to the many changes facing the healthcare industry, we were interested in completing a needs analysis to determine what issues (substance use, aging physicians, burnout, disruptive behavior, etc) those in healthcare leadership role face in dealing with physicians providing services in their facilities. We were also interested in exploring their knowledge of resources as well as their perceived needs for additional services. Please take a few moments to complete this survey. Thank you for your participation. This entry was posted in Leadership Pulse and tagged 100k Children, Choosing Wisely, Events, Honoring Choices, Leadership, SHCIP, State Health Care Innovation Plan, Survey, Upcoming Events on July 25, 2014 by admin.